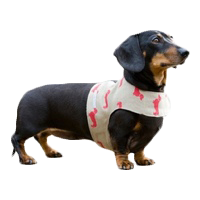 Our fabulous selection of luxury puppy harnesses will keep your puppy looking stylish whilst providing you with optimum control. Most of our luxury puppy harnesses are handmade to order for us here in England by Mutts and Hounds using the wonderful Emily Bond fabrics. These include the very patriotic Union Jack print along with the Red Dachshund. There is also a more simple yet still classic design of puppy harness made out of very eco-friendly organic ticking fabric. Teaching your dog to walk nicely on the lead is made much easier with the aid of a great puppy harness. Not only will it give you more control over your new pup but if your puppy does pull on the lead, the harness will restrain around the puppies chest and not on his delicate neck like a standard puppy collar would. Our stylish puppy harnesses are made with Velcro strap fastenings so as your puppy grows, you can easily adjust your harness to fit comfortably. Made in the UK by the wonderful top dog designer Mutts and Hounds, our luxury puppy harnesses come in a great selection of fabrics including some by Emily Bond.